The Etrusco P40 has a sleek unassuming design, and great playing characteristics, tables are available for either American (57mm balls) or English (51mm balls) pool. This table is supplied with or without a dining top. 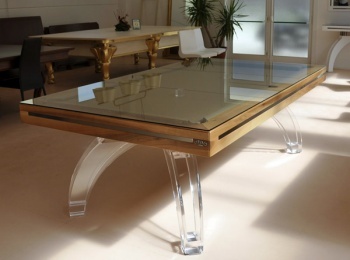 Should you decide to have a dining top you can choose between wood, glass and plexiglass. These tables come in a wide selection of sizes, there are several different sizes ranging from 7ft (Play area 180 x 90cm). The 8.2ft (Play area: 220 x 110cm) version and above offers the choice of 4 or 6 legs, depending upon your preference. 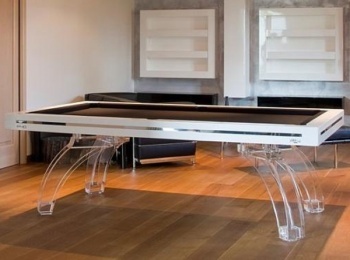 The 8.5ft, 9.3ft, and 9.5ft tables come with 6 legs as standard. The 9.8ft, 10ft, 10.7ft and 12ft tables all have 8 legs. Shown below are only a small selection of the actual table sizes available, please contact us for more detailed pricing information. These tables are made from solid wood. The legs are available in a choice of types and designs, comprising of raw oxidised steel, stainless steel, plexiglass, carbon fibre style finish, and of course matching solid wood. 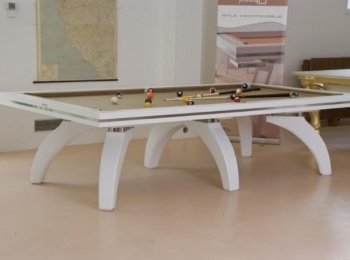 You can specify that the balls, once potted, fall into steel trays protected with plastic film (Optional extra €1300 incuding IVA), the standard table is fitted with matching leather pockets. 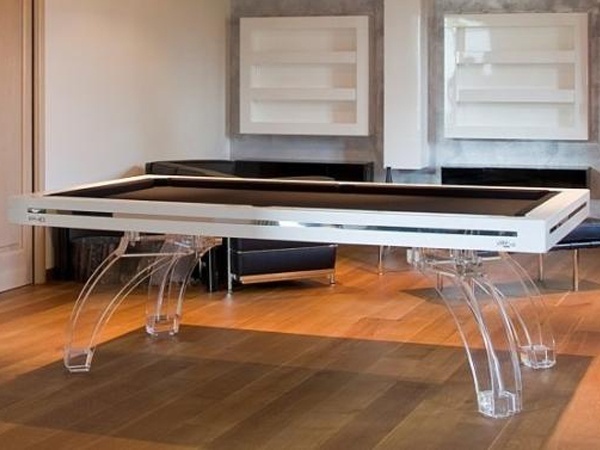 Etrusco pool tables are hand made by craftsmen in Italy, they are finished to an extremely high standard. They are solidly built to last in any environment whether it be in a commercial application or in your home. Etrusco billiard tables have been used in competitions throughout Europe. These are beautiful tables which are sought after by interior designers and professionals. 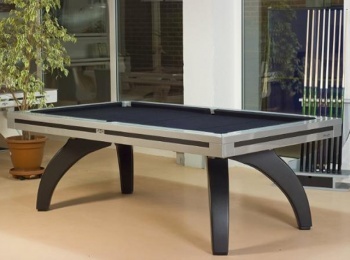 We do not carry these pool tables in stock, these are imported to order so to keep the price to a minimum on storage and transport. Lead time is generally 4 to 5 weeks on a new table. It is important to confirm the price of your table with us as the price can vary relative to the number of legs, with or without dining top, standard leather pockets or with steel drop tray, American or English version etc. It is one of the finest range of solid wood pool tables available in the market at present. It comes in five different ... sizesranging from 7ft to 12ft. The 8.2ft version offers the choice of 4 or 6 legs, depending upon your preference. The 8.5ft, 9.3ft, and 9.5ft tables come with 6 legs as standard. The 9.8ft, 10ft, 10.7ft and 12ft tables all have 8 legs. 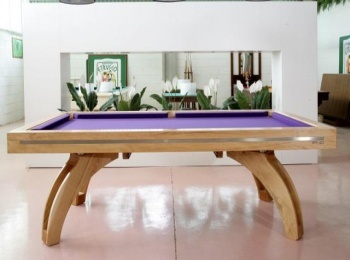 It is one of the finest range of... solid wood pool tables available in the market at present. It comes in five different sizes ranging from 7ft to 12ft. The 8.2ft version offers the choice of 4 or 6 legs, depending upon your preference. The 8.5ft, 9.3ft, and 9.5ft tables come with 6 legs as standard. The 9.8ft, 10ft, 10.7ft and 12ft tables all have 8 legs. It is one of the finest range of solid wood pool tables available in... the market at present. It comes in five different sizes ranging from 7ft to 12ft. The 8.2ft version offers the choice of 4 or 6 legs, depending upon your preference. The 8.5ft, 9.3ft, and 9.5ft tables come with 6 legs as standard. The 9.8ft, 10ft, 10.7ft and 12ft tables all have 8 legs. It is one of the finest range... of solid wood pool tables available in the market at present. It comes in five different sizes ranging from 7ft to 12ft. The 8.2ft version offers the choice of 4 or 6 legs, depending upon your preference. The 8.5ft, 9.3ft, and 9.5ft tables come with 6 legs as standard. The 9.8ft, 10ft, 10.7ft and 12ft tables all have 8 legs. This is one of the finest range of solid wood pool tables... available in the market at present. It comes in five different sizes ranging from 7ft to 12ft. The 8.2ft version offers the choice of 4 or 6 legs, depending upon your preference. The 8.5ft, 9.3ft, and 9.5ft tables come with 6 legs as standard. The 9.8ft, 10ft, 10.7ft and 12ft tables all have 8 legs.